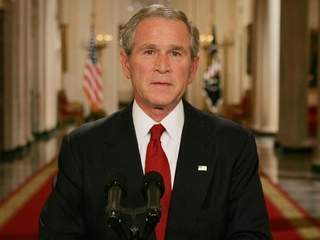 On Wednesday (9/24/08), President Bush scared the Bejesus out of the Nation, as he urged Congress to support his $700-billion plan to bailout Wall Street and take quick action. He said the country was facing a “serious financial crisis” and risked a “long and painful recession” if Congress failed to pass his proposal. Voters were fumed with anger at his request. Give the Treasury secretary broad authority to buy up to $700 billion in troubled assets, with no oversight, from any financial institution if he decides, in consultation with the chairman of the Federal Reserve, that it's necessary for market stability. Raise the $10.6 trillion statutory limit on the national debt to $11.3 trillion. Allow the Treasury secretary to buy, hold and sell the assets in any way he sees fit. That includes the ability to go outside normal government contracting practices to hire private companies to manage them. Require the government to report to congressional budget, tax-writing and financial services committees within three months of using the authority and every six months thereafter. Shield rescue program from judicial review. Expire two years after enactment. A day after his party killed his proposal bill, President Bush re-appealed to Congress to revive the unpopular plan or face “painful and lasting damage” to the economy. But Republicans, Democrats and Americans alike continue to voice their opposition to the package and their skepticism of the Administration’s urgency to shove it through Congress. As Congress bickered and pointed fingers after the bailout derailed, Americans remain in a tightfisted mood over the “government welfare” plan for corporations. Authorize $700 billion for the government to purchase troubled assets and buy equity in distressed financial firms. Require the Treasury Department to make rules to prevent excessive compensation for executives whose companies benefit from the rescue. Establish a strong oversight board with authority to halt the program, a special investigator general to monitor it, and regular government audits. Require the government to renegotiate mortgages it acquires under the program with the aim of helping borrowers keep their homes. Phase in the money for buying troubled assets, with $250 billion available immediately, $100 billion to be released if the Treasury secretary certifies it is needed, and the last $350 billion available with another certification, but subject to a congressional vote to block it.